Kyrgyzstan is a country that has overthrown its president twice in the past years. Corruption and unemployment belong to its biggest struggles and political unrest has been dominant since its independence. After the Tulip revolution in March 2005, and the fleeing of president Askar Akayev, Kurmanbek Bakiyev was elected President. However, he was ousted in April 2010 after being accused of nepotism and corruption. An interim government was established, led by interim President Roza Otunbayeva (SDPK). She called a referendum in June 2010 in which Kyrgyz citizens voted in favour of the introduction of a parliamentary democracy and constitutional changes, including curbing presidential powers. 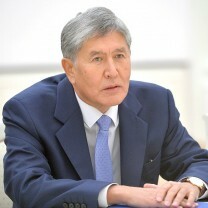 The first largely free and fair parliamentary elections took place on 10 October 2010, followed by presidential elections in October 2011, which were won by Almazbek Atambaev. The country became the first parliamentary republic in Central Asia. The process of democratization, however, did not happen without the disbandment of several coalitions between 2012 and 2016. In October 2015, the second free and fair parliamentary elections were held in Kyrgyzstan, leading to a big victory for the Pro-Russian Social Democratic party (SDPK). The presidential elections of 2017 were won by former prime minister Sooronbai Jeenbekov, a supporter of the SDPK. By joining the Eurasian Economic Union, Kyrgyzstan has taken steps to tighten relations with Russia. Want to get notified by mail when Kyrgyzstan gets updated? 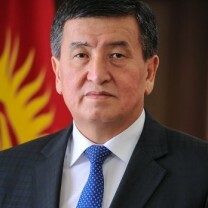 Sooronbay Sharipovich Jeenbekov (1958) is the current President of Kyrgyzstan, who assumed office on 24 November 2017. He is a zoological engineer, having degrees from the Kyrgyz Agricultural Institute and the Kyrgyz Agrarian University. In 1995 he became a Deputy of the Assembly of People's Representatives. Since then, he has held several positions as a senior civil servant: Minister of Agriculture, Head of the State Administration and the governor or the Osh region. In March 2016 he was appointed First Deputy Head of the Presidential Administration after which he got the position of the country’s prime minister. Shortly before announcing his candidacy as president, strongly supported by the outgoing president’s party SDPK, he resigned from this post. His election campaign was as controversial as his first months in office. Both of it have been accompanied by allegations of undermining Kyrgyzstan’s democratic system through the repression of opposition politicians and journalists. Kyrgyzstan declared itself independent from the Soviet Union in 1991. From Kyrgyzstan's independence in 1991 until 2005 the republic was ruled by President Askar Akayev. At first, Akayev was considered a liberal president, but his regime turned more authoritarian the longer he was in charge. In 2002 demonstrations against his rule broke out for the first time. Akayev promised to step down from office in 2005 after three presidential terms, but instead he tried to secure his power in other ways. Mass protests erupted in March against his rule following the parliamentary elections in February 2005, because of the obvious failure to meet (international) democratic standards, such as a balanced media coverage. This led to the Tulip Revolution that officially started on 24 March 2005, during which the opposition, demanding the president’s resignation, clashed with pro-government protestors. After the president had been overthrown, Kurmanbek Bakiyev, opposition leader and former prime minister, was appointed as acting PM in March 2005, but he too was ousted in 2010. Thereafter an interim government took control and a new parliament was elected. In 2015, relatively peaceful elections took place, followed by the forming of a coalition with SDP at its top, which dissolved in 2016 after a corruption scandal involving Prime Minister Temir Sariyev and an internal dispute over a referendum. The presidential elections in 2017 marked the country’s first regular transition from power of a president who has been in office for the entire constitutionally defined term to his elected successor. Former Prime Minister Sooronbai Jeenbekov won the election with 55% of all votes. After the parliamentary elections of February 2005, in which the opposition parties lost to pro-government parties, protests started over alleged election fraud. Protesters, especially in the southern part of the country, demanded new elections and the resignation of President Askar Akayev. The term ‘Tulip Revolution’ was used by Akayev himself in a speech, warning that no “Colour Revolution” should happen in Kyrgyzstan after the non-violent revolutions in Georgia and Ukraine in 2004. When a bomb exploded in the house of oppositionist Roza Otunbayeva, many blamed the government for the attack. Opposition MPs gathered outside the parliament building and protests throughout the country intensified. Akayev fled to Kazakhstan but refused to resign and was invited to Russia by Putin himself. A number of political prisoners were released and the election results were declared invalid. An interim government was formed, with former prime minister Kurmanbek Bakiyev named as interim president and Akayev was officially degraded. Because of the breakdown of the government, lawlessness was present in Bishkek and the rest of the country. The interim parliament was accused of continuing some of Akayev’s policies and unrest remained. In the following presidential elections of July, Bakiyev and Kulov ran against each other. Bakiyev won the elections and became president, while Kulov became Prime Minister until Bakiyev ousted him in 2007. April 2010 thousands of demonstrators went out to the streets of Bishkek to air their dissatisfaction with the regime. When President Bakiyev came to power he was soon seen as an autocratic ruler. The protests turned violent on 7 April, after Bakiyev ordered security forces to arrest demonstrators. Consequently, protesters attacked the police and tried to storm the government building. Police reacted by shooting at the demonstrators, killing an estimated 85 and leaving many more injured. The violence continued for several days and Bakiyev fled to the southern part of the country, where most of his supporters lived. In Bishkek the opposition forces formed an interim coalition government, led by the former Minister of Foreign Affairs Roza Otunbayeva, who announced plans to call new elections in six months. Ultimately Bakiyev fled to Belarus, while a court in Bishkek began hearing the trial of Bakiyev and 27 of his aides in connection with the shooting of protesters that April. Meanwhile tensions between the Kyrgyz and the ethnic Uzbek minority in the south of Kyrgyzstan came to the surface. On 11 June 2010 ethnic violence erupted in Osh and Jalalabad, forcing about 400.000 Kyrgyz from Uzbek descent to leave their homes. According to official numbers over 400 people were killed. By the end of June the situation was stabilized. It is thought that the ouster of Bakiyev contributed to the tensions, as the Uzbeks mainly supported the interim government, while many Kyrgyz backed Bakiyev. Interim Leader Otunbayeva acknowledged that her government was not able to ease the tensions in Osh. The Kyrgyz interim government appealed for Russian assistance, but Moscow refused to send in peacekeepers, as did the other Central Asian countries. Both the UN and the EU raised concerns about the situation. Since the collapse of the Soviet Union, Russia has sought alternative forms of cooperation with the former Soviet states. In 2010 it launched the Eurasian Customs Union, which all members of the Eurasian Economic Union (Armenia, Belarus, Kazakhstan, Kyrgyzstan and Russia) are part of. The goals of this union are “to eliminate trade and non-trade barriers within the union, and to agree on the common external tariff”. Against many protests held in 2014 by activists and NGO’s, Kyrgyzstan entered the EEU in 2015. Critics stated that joining the Russian-led union may threaten the country’s political and economic independence through a pressuring influence. Sanctions put on Russia in the past have also been negatively affecting EEU members since they are dependent on the leader’s development help. But Russia has a competitor in Kyrgyzstan. China belongs to the biggest creditors in the country and heavily supports improvements in infrastructure. Until now, both influencers have not interfered in each other’s projects. Since the country’s independence, Kyrgyz women have been the most emancipated compared to other countries in Central Asia. Women make up 52 percent of the Kyrgyz society and 42,5 percent of the labour force. Article 3 of the constitution prohibits any discrimination on the grounds of gender, ethnic origin or religious belief. The civil, penal, labour and family codes of Kyrgyzstan all uphold equal rights and the legal framework protecting Kyrgyz women’s rights complies with international standards. However, in practice the widespread discrimination and violence against women increases. Crimes of bride kidnapping, forced marriage, sexual harassment and domestic violence are often not being reported to authorities, although most of them are illegal since 2013. Women are usually ill-informed about their rights and the traditional patriarchal system perpetuates gender-based stereotypes. In 2005, only men sat in the Kyrgyz parliament, then a law was adopted that requires parties to have at least 30% female candidates on their list. Currently there are 23 female MPs in the 120 seats parliament. Political parties in Kyrgyzstan are highly personified. People tend to vote for a person rather than for the party’s ideology or program. This originates in the country’s lack of trust in the state and authorities due to corruption, organized crime and nepotism. Informal, local and trusted leaders often hold higher positions in the people’s mind. Most of them are senior leaders, leaders of women’s councils and youth leaders in communities. Sometimes also religious officials play important roles, depending on the region. Accordingly, the political parties focus on their list of candidates which they constitute out of people enjoying popularity and influence among the population. Similarly, most politicians do not regard political parties as much more than a vehicle to get into the parliament. One of the results is the existence of more than hundred political parties in the republic. Until 2010 Kyrgyzstan was a presidential republic, but since its new constitution, power has been transferred to the parliament and prime minister, making it a parliamentary republic. The president is elected every six years and is restricted to one term. The parliament is elected every five years and consists of 120 MPs. The prime minister, as the head of state, is appointed by the parliament’s absolute majority (50%). On 4 October 2015 parliamentary elections were held in Kyrgyzstan. 14 political parties participated in the election. One of the requirements for parties to register for election, is to have a list of 120 candidates and both genders have to make up at least 30 percent of the voting lists. Ethnic minorities have to make up at least 15 percent of the voting list. No party is allowed to occupy more than 65 seats in the 120 seat parliament, while a 7 percent threshold is in place for election. An estimated 60 percent of the 2.7 million eligible voters cast their ballots in the elections. According to the Central Election Commission the Social Democratic Party (SDPK) was the official winner of the elections of 2015, gaining 27 percent of the votes, which corresponds with 38 seats. In total 6 parties passed the electoral threshold and entered parliament. During the elections biometric ID cards were used to identify voters. The cards were scanned to identify voters by their fingerprints in order to stamp out voter fraud, which had led to protest in previous elections. There were some flaws with the system, leading to problems for 3 to 5 percent of the voters. According to the OSCE the elections were fair and transparent, which is unique for the region, although there were some reported small flaws and irregularities. On 15 October 2017 the latest presidential elections in Kyrgyzstan were held and marked the country’s first time, a president completed his constitutional defined term and transitioned power peacefully to an elected successor. The Kyrgyz president is elected by direct universal suffrage. The candidate who wins more than half of all votes wins, there are no turnout requirements for the election’s validity. The main opponents in the race were prime minister Sooronbai Jeenbekov, nominated by the outgoing president’s Social Democratic Party (SDPK), and former prime minister and businessman Omurbek Babanov, who is the leader of the conservative-nationalist Respublika-Ata Jurt (Fatherland), the second strongest party in parliament. There were 9 other candidates, including one woman and altogether three former prime ministers. 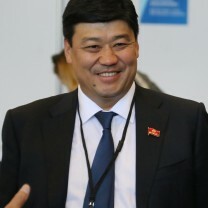 Jeenbekov won the election with 55% of all votes. He stated that he will do anything to be worthy of the trust the people have given him. Additionally, he said that his task is to strengthen the economy and maintain achievements from the past. The campaigns of the candidates focused mainly on personality. Therefore, switching sides during the campaign was easily done by many candidates because none of them followed a strict ideology. The most important issue was how the candidates related to the deep divide between the north and the south of the country. Especially Jeenbekov built his campaign on his high influence on politicians from the southern provinces. As a candidate who was handpicked by the outgoing president and his party, which remains the strongest one in parliament, he heavily emphasized on continuing the policies of president Atambaev. The campaigning was accompanied by raised tensions between Kyrgyzstan and its neighbour Kazakhstan. The diplomatic dispute after a meeting between the presidents of both countries resulted in harshly voiced opinions of the candidates. The Kyrgyz government formally accused Kazakhstan of supporting the strongest opponent Babanov. The OSCE noted irregularities, but still called the election one of the most competitive in Central Asia. The technical execution was “well-administered” and the voting itself went mostly without bigger problems. Minor problems were noted during the vote count and ballot secrecy. A more significant problem was the media freedom, which was in part restricted and showed a bias on the president’s candidate. Popular independent media agencies were sued and fined by the government. Accusations included insulting the president. Experts said that Atambayev tried to keep criticism on him and his candidate as small as possible. Furthermore, political opponents of the president and his candidate were sent to prison, the most prominent one being Omurbek Tekebayev, leader of the Ata-Meken (Fatherland) Socialist Party, which has 11 seats in parliament, and held a position of a strong rival. He was sentenced to eight years in prison because of alleged corruption two months before the election and could therefore not participate. Tekebayev denied the accusations, saying that it was a politically motivated case. He is currently serving his sentence in prison. On 27 June 2010, the Kyrgyz citizens voted in a referendum for the introduction of a parliamentary democracy after the ethnic unrest in the preceding weeks. Many people were unsure whether to proceed with the referendum considering the many (Uzbek) people who were homeless at that time. The interim government decided to pursue the referendum, because it would also give legitimacy to the new government. Over 90 percent of the participants voted in favour of the proposed constitution. According to the new constitution, no political party can be created on religious or ethnic grounds, and members of the armed forces, police, and the judiciary are not allowed to join a party. Another significant change is that the president has lost the right to appoint all 13 members of the Central Election Commission. This key electoral body now consists largely of independent civil society leaders. The voter turnout at the referendum was nearly 70 percent. OSCE monitored the elections and stated that “although there were evident shortcomings, the reported high turnout indicates citizens' resilience and desire to shape the future of their country”. Some Uzbeks had problems with voting, because their passports were destroyed during the riots or they were afraid to leave their neighbourhoods to vote. The interim government decided that people could vote without their passport if they registered their home address at a municipal office. Overall, the international election commissions administered the process in a largely transparent, collegiate and timely manner. The Social Democratic Party of Kyrgyzstan (SDPK) was founded in 1993 by Abdygany Erkebaev, who was replaced by Almazbek Atambaev as its chairman in 1999. After Atambaev was elected President he had, in accordance with Kyrgyz law, to distance himself from the party and Chynybay Tursunbekov became the party’s chairman. The party formed a coalition with the larger El Party in preparation for the February 2005 parliamentary elections. The SDPK emphasizes a socially oriented development, economic revival and has been a great proponent of the establishment of a parliamentary system. The party played an important role in the Tulip Revolution of 2005 and in large-scale public protests against the Bakiev government in April and November 2006. Prominent members are Roza Otunbayeva, interim President from April 2010 until December 2011, and current President of Kyrgyzstan Almazbek Atambayev. The SDPK has contacts with the Socialist International (SI), but does not have any status within the organization. The SDPK came in first in the 2015 parliamentary elections and gained 38 seats in parliament. The current president Sooronbay Jeenbekov was a candidate of SDPK in the presidential elections in 2017. Omurbek Tekebayev founded Ata-Meken in 1992 following a split from the Erkin Kyrgyzstan party. He has been the party leader ever since. The party participated in all parliamentary elections, winning seats in the Kyrgyz parliament in 1994 and 2000. Tekebayev was Speaker of Parliament from March 2005 until February 2006, but resigned after a clash with former President Bakiyev. Since a charge against him for corruption, he has been declined a candidacy in the 2017 presidential elections and currently serves an eight years term in prison. The case is widely believed to be politically motivated and planned by former president Almazbek Atambaev. The party favours parliamentary democracy and economic reforms and can be considered as positioned at the centre-left. It supports a compromise between various social sectors and government bodies. Ata-Meken is popular mostly in the north of Kyrgyzstan. Therefore the party is trying to strengthen its ranks with members of the parliament representing different regions, hoping to widen its support bases. In the parliamentary elections of 2015 the party just passed the electoral threshold and holds 11 seats in parliament. The Communist Party of Kyrgyzstan (PPK) says to have about 2000 members and is one of the largest parties in Kyrgyzstan. The party was founded in 1992. It is not to be confused with the Communist Party of Kyrgyzstan (KPK). The party calls itself social democratic and says it accepts a pluralistic political system and a market economy but strongly opposes to the privatization of public assets such as the energy system. Additionally, it sees itself as the successor of the Communist Party of Kyrgyzstan, which used to control the country under Soviet rule. The official leader of the party is Iskhak Masaliyev, who has assumed this position repeatedly in the past decade. He was also the chairman, a post separate from the leader. Iskhak Masaliyev resigned from his position as chairman in August 2010 as he was temporarily detained in May that year, accused of planning mass disorder and attempting to overthrow the government. His case was sent to court on 25 October 2010. Masaliyev said his detention prevented him from campaigning for the parliamentary elections. The position of chairman is currently held by Mamaseitova, the son of former party-leader Absamat Masaliyev, who led the party until his death in 2004. The Communists further failed to garner enough votes in the 2015 parliamentary elections to have seats in the parliament. The party also publishes the Pravda Kyrgyzstana. The right-wing party Ata Jurt won the most seats (28) in the parliamentary elections of October 2010. The party was founded in 2004 by interim President Otunbayeva (2010-2011) and several others. Otunbayeva however later became a member of the SDPK. Ata Jurt has a strong base in south Kyrgyzstan, because of its hardline nationalistic rhetoric and call for economic support of the southern part of the country, and they supported ousted president Bakiyev. In 2014, however, Ata Jurt merged with Respublika, a nationalistic party that embraces Kyrgyzstan’s ethnic diversity. 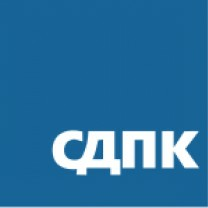 In the 2010 parliamentary elections, that were held just after the formation of Respublika, the party gained 23 seats. In the 2015 parliamentary elections the combined Respublika – Ata Jurt party became the second largest party with 20 percent of the votes and 28 seats in parliament. The Kyrgyzstan party was created in May 2015 by former Respublika MP Kanatbek Isaev. It has a strong support base in the south of the country. In the 2015 parliamentary elections Kyrgyzstan gained 12.8 percent of the votes and 18 seats in parliament. Former Respublika MP Altynbek Sulaimanov founded Bir-Bol in 2014. Bir-Bol is a technocrat party that is supported throughout the country. The party supports the return to a presidential system instead of the parliamentary system. In the 2015 parliamentary elections Bir-Bol gained 8.5 percent of the votes and 12 seats in parliament. The Onuguu (Progress) party was founded in 2012 by former deputy speaker of parliament and Respublika politician Bakyt Torobayev. It has a stronghold in the southern part of the country. In 2013 Onuguu was joined by the Unity of Peoples party, another party that had strong support in the south. From the start, Onuguu-Progress has opposed the government in Bishkek, as well as an alternative to the traditional opposition party Respublika-Ata Jurt. In the 2015 parliamentary elections Onuguu-Progress gained 9.3 percent of the votes and 13 seats in parliament. Butun Kyrgyzstan is a nationalist party popular in the south of the country. 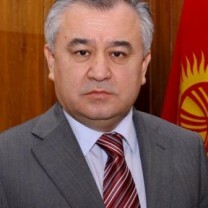 The party's leader, Adakhan Madumarov, previously served as the national security council chief under former president Kurmanbek Bakiyev. In 2015 Butun merged with the Emgek (Labor) party, but during the 2015 parliamentary elections they gained 6.18 percent of the votes, just below the 7 percent threshold and thus did not enter parliament. The Kyrgyz diaspora has created parties representing the interests of hundreds of thousands of Kyrgyz labour immigrants abroad. The biggest of those parties is called Zamandash, which was established in 2007. It is considered to be nationalist and pro-Russian, a tactic adopted due to its many supporters working in Russia. In the 2015 parliamentary elections Zamandash gained 2.8 percent of the votes, gaining no seats in parliament. Almazbek Atambayev was born on 17 September 1956 in the village of Arashan in the north of Kyrgyzstan. He graduated from the Moscow Institute of Management with a degree in economics and went into business afterwards, becoming director of manufacturing companies. From 1983 to 1987 he served in the Supreme Council of the Kyrgyz SSR. Atambayev is one of the founding members of the Social Democratic Party and became its chairman in 1999. He ran for president in the 2000 elections, but was unsuccessful. In 2005 and 2006 Atambayev headed the Ministry of industry, trade and tourism, but resigned in April 2006, accusing Bakiyev of corruption and of blocking reforms. Nonetheless, in April 2007 he became Prime Minister under Bakiyev in an appointment that was seen as a concession to the opposition. However, in November 2007 he resigned again, because of Bakiyev’s nepotism and corruption. He ran in the 2009 presidential elections and received about 8 percent of the vote. Together with others he claimed there were mass violations, but his protest was unsuccessful. He was elected 4th president of Kyrgyzstan in the 2011 elections and served until 2017. Therefore he is the only Kyrgyz president to have served the entire by the constitution defined term and has given up his position for his own candidate and successor Sooronbay Jeenbekov. During the campaign for the presidential elections, he caused several controversies due to his harsh words used against Kazakhstan, possible imprisonment of opponent candidates and censorship in media. Kamchybek Tashiev is a relative newcomer to the Kyrgyz political scene and was seen by many as the most controversial of the presidential candidates for the presidential elections in 2011. He has been a member of parliament and served as minister under President Bakiyev. Disagreements led to his resignation in 2009, leaving Tashiev free to emerge as an influential opposition leader as the Bakiyev administration fell. But critics still accuse him of links with the former President. Tashiev 's numerous followers in the cities of Osh and Jalalabad credit him with stopping the bloodshed during ethnic clashes there in June 2010. But his claims that Uzbek community leaders instigated the violence earned him the image of a divisive nationalist, a label that has also been attached to his party Ata-Jurt. Tashiev is known to be a supporter of strong presidential power. In the presidential elections of 2011 Tashiev came in third with 14.3 percent. In the presidential elections in 2017, he did not participate. 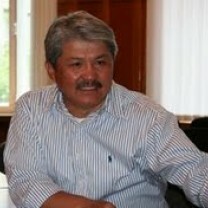 Omurbek Tekebayev was born in 1958 in Jalalabat, Kyrgyzstan. Tekebayev graduated in physics and in law from the Kyrgyz State National University. In 1991 he was one of the founders of the Erkin Kyrgyzstan National Democratic Party. One year later the party split and he founded the Ata-Meken Party and served in the Kyrgyz parliament from 1995 to 2005. Tekebayev ran for president in 2000, receiving 14 percent of the votes. When Akayev was ousted in 2005 he became the speaker of the new parliament. Tekebayev resigned in 2006 and played a key role in organizing protests against Bakiyev in 2006. He founded the For Reforms Party, demanding reforms from Bakiyev. Tekebayev stepped down as chairman of the party in March 2007, but remained politically active and an outspoken critic of Bakiyev. He was arrested on 6 April 2010 during the violent protests against Bakiyev, but was released later that day. Tekebayev was appointed to serve as deputy in charge of carrying out constitutional reforms by interim President Roza Otunbayeva. Despite hailing from the south, Tekebayev is seen by many as one of the few politicians who attracts support (and vehement opposition) across regional cleavages. When the new parliament was formed, Tekebayev was nominated as speaker for the ruling coalition. However, he narrowly failed to win the majority vote required to endorse his candidacy. Ata-Meken subsequently entered opposition as the smallest of the five parties in the national legislature, with 11 seats. For the presidential elections in 2017, he announced his candidacy. He was considered to be one of the strongest opponents to the president’s own candidate Jeenbekov. But only two months before the election, he was accused of corruption and sentenced to eight years in prison, making it impossible for him to continue to run for president. He stated that the case was politically motivated and planned by the government. Since then, he has been serving his sentence. 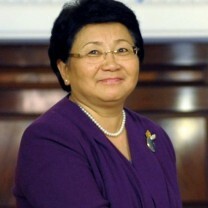 Roza Otunbayeva was born on 23 August 1950 in Osh. She graduated from the Philosophy Faculty of Moscow State University in 1972 and went on to teach as senior professor and head of the philosophy department at the Kyrgyz State National University. Her political career began in 1981 in Bishkek as the second secretary of the Lenin “rayon” council of the Communist Party. From 1986 to 1989 Otunbayeva was the deputy chairwoman of the council of ministers. Subsequently she served as head of the USSR Delegation to UNESCO in Paris and as the Soviet Ambassador in Malaysia. In 1992 Otunbayeva became the Kyrgyz ambassador to the USA and Canada and from 1994 until 1997 she served as the Kyrgyz Minister of Foreign Affairs and Deputy Prime Minister under Akayev. Atter that she became the Kyrgyz ambassador to the United Kingdom and the United Nations special deputy to Georgia. Otunbayeva returned to Kyrgyzstan in 2004 and founded the Ata-Jurt party together with three other opposition parliamentarians. She was a driving force behind protests against Akayev and after the Tulip Revolution she was appointed Foreign Minister by the new President Bakiyev. However the parliament failed to confirm her in the post. Otunbayeva then went into opposition as a member of the Social Democratic Party. She played a key role in the November 2006 protests that pressed successfully for a new democratic constitution, and became highly critical of Bakiyev, saying that his government continued the corruption and nepotism of Akayev. Otunbayeva was elected into parliament in December 2007 and served as head of the parliamentary group of the Social Democratic Party from October 2009. On 7 April 2010 Otunbayeva was selected by opposition leaders as the interim President, receiving overwhelming popular support in the June referendum. She was the first female interim Head of State in Kyrgyzstan and Central Asia. Otunbayeva was prohibited from running in the following presidential elections that were held in 2011. Her term ended on 1 December 2011 after Almazbek Atambayev was elected in the presidential elections on 30 October 2011. Bakyt Beshimov was born in 1954 in Bishkek. He graduated with a PhD in history from the Kyrgyz State National University. He maintains high positions in the academic world, such as visiting professor at the Massachusetts Institute of Technology Centre for International Studies and Harvard University's Davis Centre for Russian and Eurasian Studies. Additionally he served as president of Osh State University, where he strongly criticised then president Askar Akayev. He later was appointed ambassador to India, Bangladesh, Nepal and Sri Lanka. During the Tulip Revolution, he functioned as a supporter from the opposition. In 2007 he became a member of the Kyrgyz parliament through the list of SDPK. Furthermore he was offered a position as ambassador to the US, but turned it down. Beshimov is known to get into the role of a mediator and diplomat, even at times when he was in opposition. Since being appointed chairman of the SDPK, the party has won 38 seats in parliament, making it the strongest force in legislation. Kanatbek Isaev is the current leader of Kyrgyzstan party, which holds 18 seats in parliament. He planned on running for presidency in 2017, but election officials rejected it because he did not submit the required 35000 signatures by supporters. In September 2017 he was arrested by the State Committee for National Security (UKMK) and charged with organising mass disturbances and a “violent seizure of power” in course of the presidential elections. Other accusations also include corruption, a widespread problem in Kyrgyzstan. He stated that the charges were politically motivated because he is a relevant opposition leader. The court sentenced him to twelve years in prison. His lawyers appealed to the decision and as for March 2018, the case is still open. Bakyt Torobayev was born in 1973 in Jalal-Abad. He is the current leader of the Onuguu-Progress party, which holds 13 seats in parliament. He has his background in managing and a degree in economics of the Kyrgyz State National University. Through the list of then president Kurmanbek Bakiyev’s Ak Zhol party, he got a seat in parliament in 2007. Before Bakiyev’s overthrow, he served as the country’s Minister of Emergency Situations. In 2010, he joined the Respublika Party of Kyrgyzstan of Omurbek Babanov. Due to many disputes inside the party, he left and joined Onuguu-Progress. Torobayev strongly supports the parliamentary system and considers himself to be “centrist”. His main goals are the improvement of a free market and a bigger competition in political elections. He originally planned to run for presidency in 2017, but withdrew his candidacy shortly before.